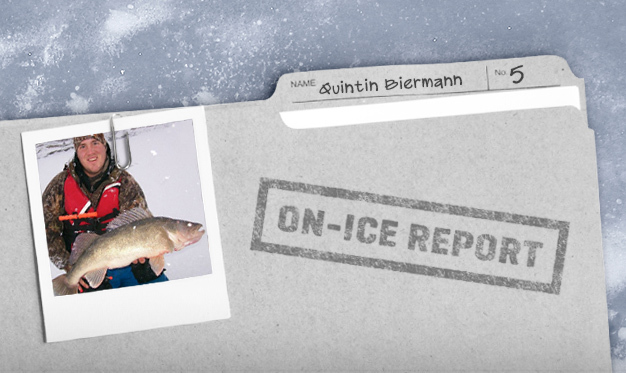 On the heels of “wacky” weather that’s dropped the Ice Belt into the Deep Freeze, hot spots and patterns have been hard to come by for Quintin Biermann. Still, he’s been able to find some biters in South Dakota’s Glacial Lakes and Prairie Region. “It’s been tough to keep fish on a pattern, as far as location goes… and what the fish want,” says the ICE FORCE Pro-Staffer and In-Depth Outdoors TV personality. Before a massive cold front swept across the Ice Belt, Biermann reports, prairie fish were riding high in the water column, eating shrimp and gorging on bloodworms. He’d find them during the day on the tips of main lake points and adjacent mudflats. Those fish were usually aggressive, hitting a 1/8 oz. spoon tipped with spikes or a minnow head. Two colors were the most effective – silver with red stripe and silver with green stripe. “It’s so fun to see a fish come six to seven feet off the bottom to meet your spoon and inhale it with a minnow head or a wad of spikes on business end,” Biermann says. After 10 inches of snow and a cold front, fish didn’t move far, but were much more picky. “Prime bite periods were key, as the barometer was through the roof,” Biermann reports. As air temps hovered around zero degrees on the first day he hit the ice after the big freeze, he found many lookers but few biters. “Fish would come in to aggressive [spoon] jigging, but would not take the bait,” he says. He had more luck on 5 mm or smaller jigs in red and orange. When fishing this pattern – which he calls “stacking the box” – he runs his LX-7 [Product 'LX-7' not found!] in chart mode, which “easily shows fish size, lure size and separation. Although Biermann prefers running and gunning for perch and walleyes, uncharacteristically clear water and cold fronts have made his favorite species exceptionally finicky at midday. So when those fish aren’t hungry for lunch, he goes looking for toothy critters known for big appetites – pike. To target midday pike in the shallow prairie lakes he fishes, Biermann spools up 10-pound Sufix Ice braid tied with large-profile blade baits and swimming baits. He drills a series of holes in shallow water near patches of old weed growth, which are often located near the mouths of feeder creeks. “These creeks keep weed growth alive longer with steady oxygen flow, which attracts bugs and minnows, thus big predator fish,” he says. When fishing this pattern, Biermann cautions, hold on tightly, as “fish come in hot and heavy, slamming the bait before you have time to even go into a subtle jigging cadence.” To elicit bites, he sharply swings up his rod tip then follows with several small tugs on the rod tip to keep the bait moving. Ice in feeder-creek areas can be sketchy at times, he cautions, so take all possible safety precautions when fishing this pattern. Biermann will be back on the ice soon, bundled against the cold and icing more limits. He wishes you luck with his tips. Formed by retreating glaciers more than 20,000 years ago, South Dakota’s Glacial Lakes and Prairie Region extends from Aberdeen to Watertown, Brookings to Huron and Milbank to DeSmet. Biermann’s home base is Webster, SD. This entry was posted in Uncategorized and tagged 832 Advanced Ice Braid, LX-7, MarCum Technologies, Quintin Biermann, StrikeMaster, Sufix. Bookmark the permalink.